Newspaper circulations in developing economies and in number of developed countries are increasing daily, putting an end to the myth that with focus on web media, newspaper futures look bleak. Renowned New Delhi-based Asia Media Design director, Jai Kumar Sharma, says instead of having a gloomy outlook about the future of newspapers, they are in fact blooming in many parts of the developing world. 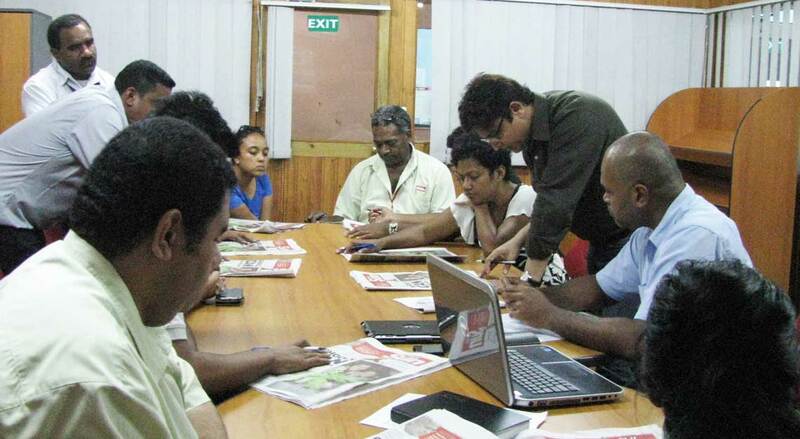 Mr Sharma has been working on the redesign of Fiji Sun Online and the overall Fiji Sun newspaper look. He has been running training at the Fiji Sun with a colleague, Manav Mishra. Mr Sharma has worked throughout Asia and Africa and has successfully given new looks to papers in India which are now world leaders. “The speculations that newspapers would be shutting down tomorrow or in the near future is wrong,” he said. “With innovative ideas, newspapers have a long way to go. This is the time when the best will sell. However, the old practices of newspapers will not work anymore.” Mr Sharma said other mediums such as television, radio, web and newspapers would not compete with each other, rather they would be complementing each other. “As economies grow, people are having more and more buying power and they can afford to look at different mediums,” he said. Mr Sharma said newspapers’ credibility and the ability of print journalists to get analytical articles ready for publication in time works in favour of newspapers. “Gadgets are getting smaller but people are always going to miss the big canvas, which is the newspaper. The readers and advertisers want a bigger canvas. With print, people feel ownership,” he said. “When they buy a newspaper, they feel its theirs, it is in their hands and no one can change even a letter.